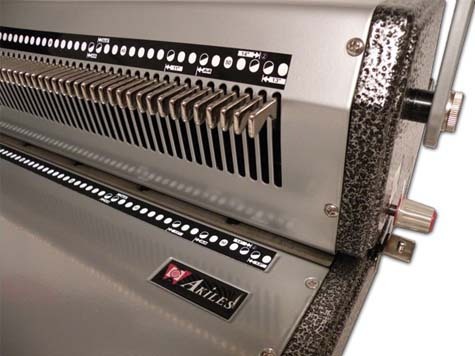 Akiles CoilMac-M renders efficiency and productivity. Its high quality components and full range of functions make it the most complete and durable equipment in its class, and one of the easiest to operate. Akiles CoilMac-M is undoubtedly the ideal partner for your important coil binding jobs. OVAL holes: Special 4 x 5mm oval holes. The first & only equipment of its class to offer this advanced feature. Makes coil insertion much faster as compared to standard round holes. 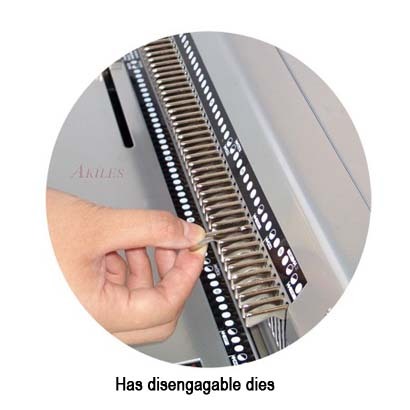 FULLY Disengageable Pins: For a completely clean & professional punching of any paper size, all 54 pins can be independently pulled & disengaged. LETTER 4:1 pitch (0.248"): This revolutionary 0.248” coil pitch is specifically designed to give you 44 evenly-centered holes in an 11” sheet, which provides the most ideal hole to edge-of-sheet margins and easier coil insertion. Hole pattern is 100% compatible with STANDARD 4:1 pitch coils. Extended Single Punching Length (13"): With open ends & continuous punch guide to easily punch documents of any length (up to 26"). 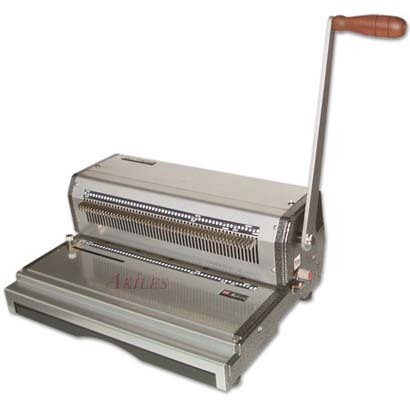 High Volume Punch Capacity: Suggested up to 20-sheet* for 20 lbs paper, or 2.6mm (28-sheet equivalent)** for hardboard, in 13" length (53 holes). Super Strength Punch Mechanism with exclusive “Precision Guiding System" Blade Set: Cast-hardened & heat-treated steel dies provide superior strength & hardness. Exclusive “precision guiding system" guarantees a sharp & clean perforation everytime. Exclusive EZ Inserting TableTM with Detachable Design: Expedites the inserting of coil into the document; reducing costs and binding time. 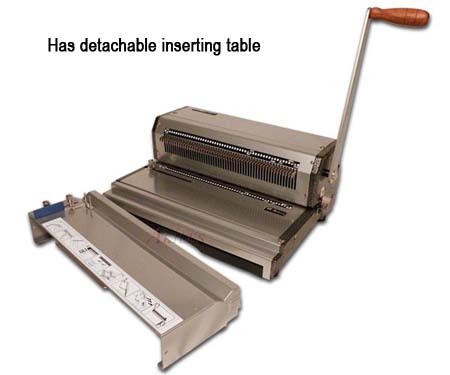 Detachable design allows the Punch & Inserting Table to be placed side-by-side, allowing one person to punch the paper while another person to insert the coils… a great time-saver on those time-sensitive binding projects. Side Margin Control: Provides an evenly centered punch for all document sizes. 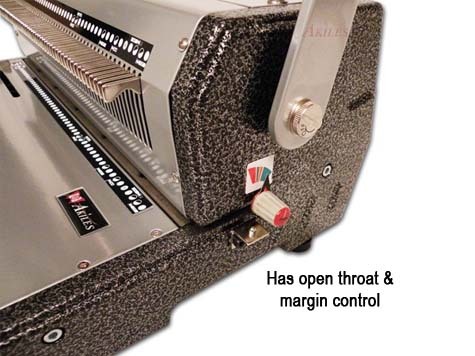 Punching Margin Control: Provides the correct punch-margin-depth for each coil size and maximizes the document's tear resistance. Open Throat and Continuous Punch Guide: For an easy alignment and punching of longer documents up to 26". 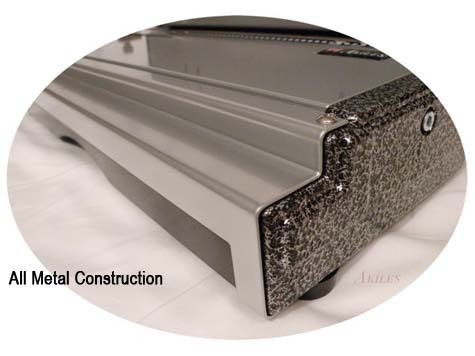 Rugged ALL Metal Construction: Makes it the most reliable & durable coil binding system in its class. ISO9001 & 14001 Quality: Manufactured under ISO9001 & 14001 guidelines for highest quality control & environmental management standards.